In a communication system, the word ‘signal’ is commonly used. Therefore we must know its exact meaning. Mathematically, signal is described as a function of one or more independent variables. Basically it is a physical quantity. It varies with some dependent or independent variables. 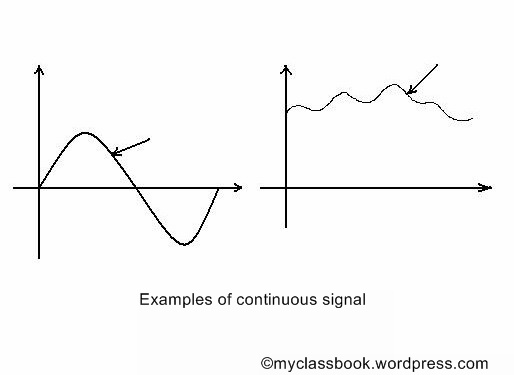 A signal of continuous amplitude is called continuous signal or analog signal. Continuous signal has some value at every instant of time. Sine wave, cosine wave, triangular wave etc. similarly some electrical signals derived from physical quantities like temperature, pressure, sound etc. are also an examples of continuous signals. For every fix value of t, x(t) is periodic in nature. If the frequency (1/t) is increased then the rate of oscillation also changes. In this case the value of signal is specified only at specific time. 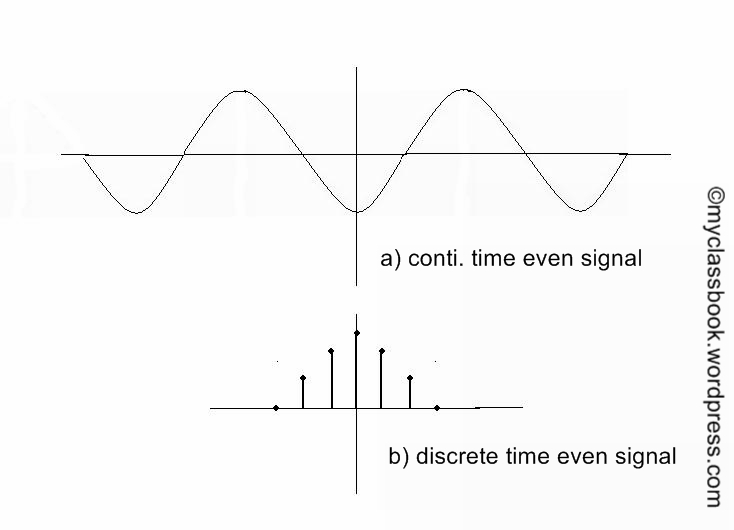 So signal represented at “discrete interval of time” is called as discrete time of signal. 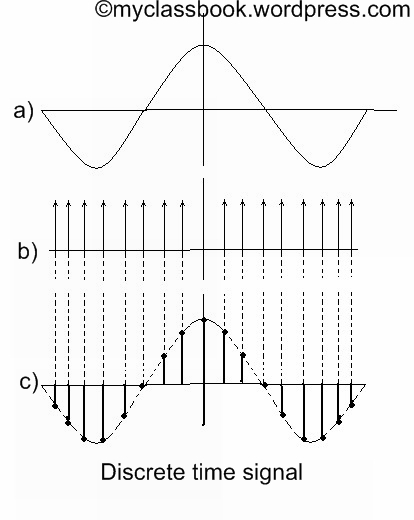 The discrete time signal is generated from continuous time signal by using the sampling operation. This process is shown in figure below. Consider a continuous analog signal as shown in figure a). This signal is continuous in nature from –infinity to +infinity. The sampling pulses are shown in figure b). These are train of pulses. Here the samples are taken with Ts as sampling time. 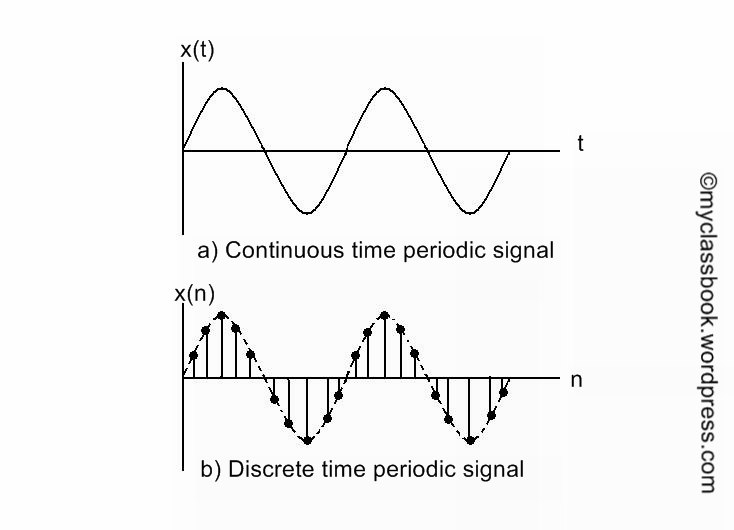 Discrete time sinusoidal signals are identical when their frequencies are separated by integer multiple of 2p. If the frequency of discrete time sinusoidal is rational number, then such signal is periodic in nature. For the discrete time sinusoidal, the highest oscillation is obtained when angular frequency w=+p or –p. If the variation in the amplitude of signal is continuous then, it is called continuous valued signal. Such signals may be continuous or discrete in nature. Following figure shows the examples of continuous valued signals. 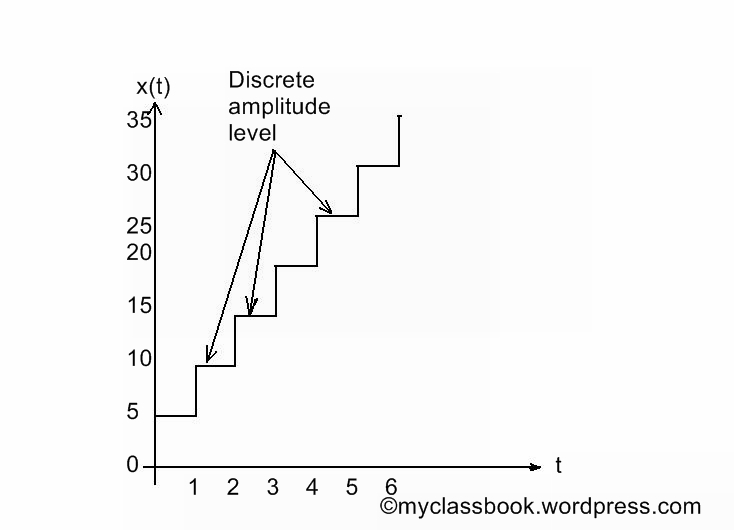 If the variation in the amplitude of signal is not continuous but the signal has certain discrete amplitude levels then such signal is called as discrete valued signal. Such signal may be again continuous or discrete in nature as shown in figure below. This is called as condition of periodicity. Here T0 is called as fundamental period. That means after this period signal repeats itself. Here number ‘N’ is the period of signal. The smallest value of N for which the condition of periodicity exists is called fundamental period. A signal which does not repeat itself after a fixed time period or does not repeat at all is called as non-periodic or aperiodic signal. In other words we can say that, the period of non-periodic signal is infinity. Condition for symmetry: x(t)=x(-t)……..for continuous time signal. Here x(-t) indicates that the signal is present for negative time period. That means x(-t) is the signal which is reflected about vertical axis. Condition for symmetry: x(n)=x(-n)…….for discrete time signal. 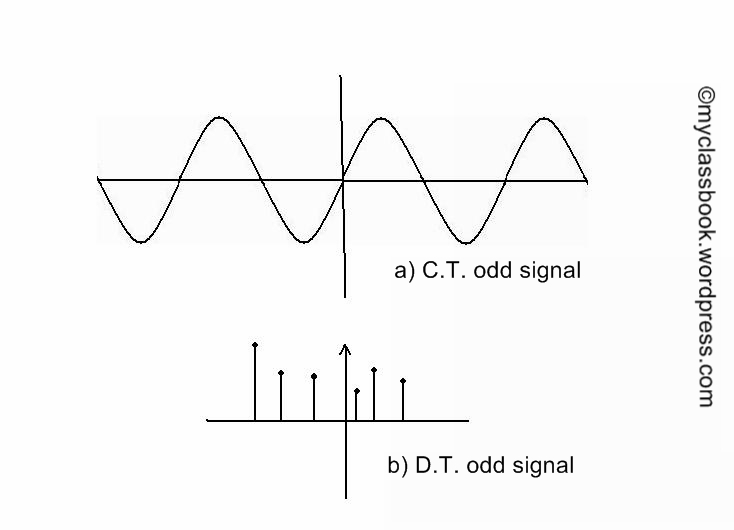 Condition for odd signal: x(-t)=-x(t)…….for continuous time signal. Here x(-t) indicates that the signal is present for negative time period. 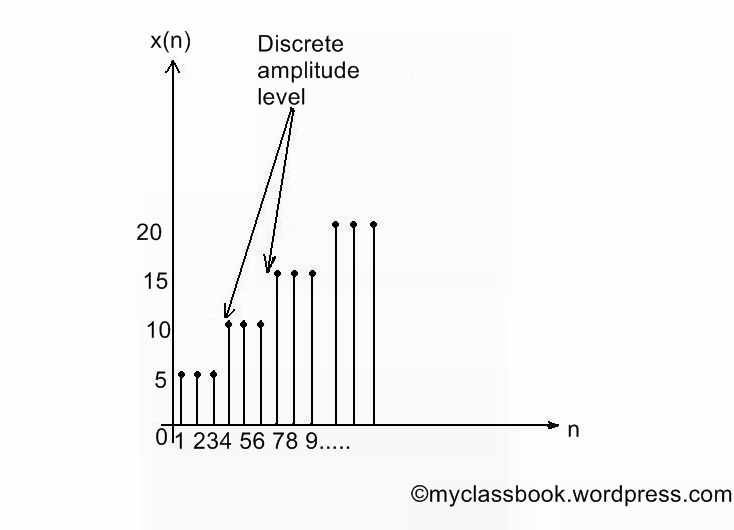 While –x(t) indicates that the amplitude of the signal is negative. Thus odd signal is not symmetric about vertical axis. 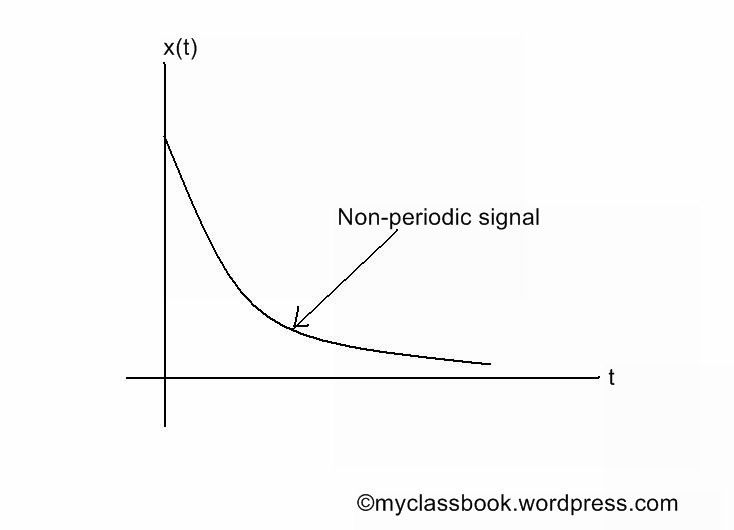 Condition for odd signal: x(-n)=-x(n)……for discrete time signal. Note: amplitude of odd signal at origin is always zero.